It was a great afternoon at Melville Golf Centre. 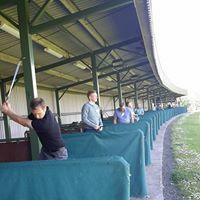 Members and Non Members have an opportunity for a short lesson at the range with PGA Professionals, followed by the option to play 9 holes and for beginners to practice on the short game area. Great way to do Networking with NetGolfing. You meet people, you make friends in an informal way. It's all about Networking in a different format, to allow people to get together socially to develop business contacts.